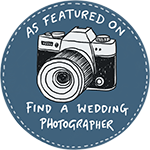 Photographing weddings in Sheffield in the middle of the summer is glorious – Joelle & Scott had a fab sunny day for their wedding. Joelle looked amazing in her dress which was great as thery were running late in the morning so I had to dress her – all in a days work! I love her bouquet with the feathers in it too. So cute! It was a short drive to Hazel Gap Barn in Nottinghamshire where the ceremony was taking place and a nervous looking Scott was waiting! The ceremony was lovely with personal readings and afterwards guests headed out into the sunshine for photos and champagne. The grounds are beautiful so plenty of places for photographs! The reception room was dressed with lovely details and a very tempting dessert table! The speeches were fantastic and funny before the evening entertainment kicked off with a lively band who got everyone up on the dancefloor!